Autumn is when the Scenic City really earns its name. 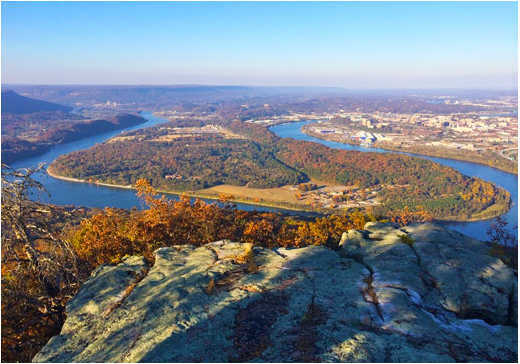 Chattanooga has become one of the top outdoor destinations in the country, with paddling, hiking, climbing, trail running, and mountain bike opportunities in every direction. Visitors can enjoy these trails any time of the year, but it never looks more beautiful than when the leaves turn color in the fall. Here are five outdoor destinations that will make an October visit to Chattanooga one you won’t forget. Let’s start with Chattanooga’s oldest wildlife sanctuary—Audubon Acres. The naturalist Robert Sparks Walker founded the Chattanooga Audubon Society in 1944 to preserve his family’s farm. The property has more than 4 miles of easy hiking trails on both sides of South Chickamauga Creek. After touring the small visitor&apos;s center and museum, look for the Spring Frog Cabin. Walker was born there, and the cabin is believed to date back to the 1700s. 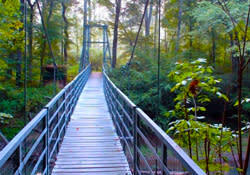 Once across a suspension bridge over the creek, the trails skirt the hillside with good views of the water. In the other direction, a longer path leads down to a meadow, which was once the site of Little Owl Village, dating back to the 1400s. In addition to an abundance of wildlife—owls, hawks, and turkey are commonly seen—many trees are labeled with their scientific, common, and Cherokee names. Picnic tables, a fire ring, and open space for recreation help make this an all-day destination. 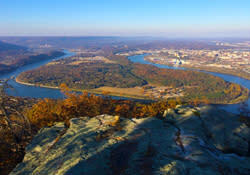 Point Park boasts the most famous overlook of Chattanooga—and it looks even better when you&apos;ve earned it by coming up from the Cravens House. The home was originally owned by Chattanooga iron industrialist Robert Cravens. The structure was destroyed during the Battle of Lookout Mountain (or perhaps afterward by Union soldiers). Park at the Craven&apos;s House and access the trailhead from the back of the parking lot. At the intersection, almost within sight of Cravens, bear left up the Cravens Trail, which climbs for nearly a mile at a modest incline with no steep sections. The Point is a beautiful and educational destination that includes a museum and gift shop. From the lower museum, the views of the Tennessee River valley are spectacular. Now for the descent! At the bottom of the big steel staircase, turn right to take the Mountain Beautiful Trail. Be sure to have a look at the Civil War memorial plaque in the rock above, which is across from the site of the old Point Hotel. Raccoon Mountain features nearly 30 miles of intermediate to advanced single track, and it’s the crown jewel of Chattanooga mountain biking, just a short 15 minutes from downtown. This well-planned, sustainable trail system is built around the reservoir for TVA’s pumped-storage plant, turning previously-underused mountain terrain into a popular recreation area and a mountain biking paradise. There are three trail-access parking areas on top of the mountain (East Overlook, Switchyard and Laurel Point) and two more at the bottom (Massengale Point, Boat Ramp). While many locals use the East Overlook parking in order to hit the trails quickly after work on weeknights, the best facilities are at Laurel Point which features a bike wash, repair stand, changing rooms, water fountain, and bathrooms. Laurel Point is the only place on the mountain with water, so if you need to refill your bottle or hydration pack mid-ride you’ll need to plan accordingly. Parking at the boat ramp guarantees a brutal climb to start your day, and an excellent downhill to end it, no matter which direction you ride. If there&apos;s one place you have to visit this fall, it&apos;s Rock City Gardens located atop Lookout Mountain just miles from Downtown Chattanooga. This October, get in touch with Rock City’s German Heritage during their annual Rocktoberfest. Enjoy a celebration of harvests and fall foliage featuring live German music, polka lessons, German food, specialty beer, costumed characters, and fun for the whole family. There&apos;s no better place to be after a hike on Lookout Mountain or Raccoon Mountain! 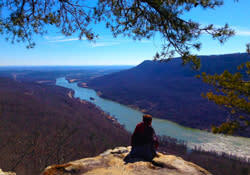 With multiple accessible sections, the Cumberland Trail’s southern terminus is located just 9 miles from downtown Chattanooga at Signal Point. It’s a must-experience outdoor destination for hiking, trail running, backpacking, and primitive camping. Lined with high ridges and deep gorges along the rugged and cliff-lined eastern edge of Tennessee’s Cumberland Plateau, the Cumberland Trail is an ambitious trail project. When completed, it will extend 300 miles from Cumberland Gap National Park in Kentucky to the Chickamauga Chattanooga National Military Park on Lookout Mountain, Tennessee. The trail is typical of most southeastern trails in the sense that rocks, roots, and leaves are constants. While some areas get technical and involve more elevation change, all of these sections are appropriate for careful beginners as well as advanced trail runners, hikers, and backpackers.